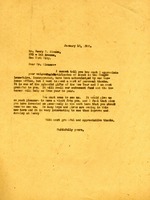 A certificate of appreciation awarded to Miss Martha Berry from the Roosevelt Memorial Association regarding two Roosevelt pictures she presented them with. Signed by R.W.G. Vail.